If you know how to knit this will come really easy to you, but if not this is a great way to learn it’s very intuitive. I have to admit to being skeptical about arm knitting when I first read about it; however, the moment I connected it to art yarns, I was hooked! I have some handspun skeins that I’ve been wearing as scarfs that now show off the spinning lovely. Here I’m working with Knit College Emerald Rainforest a wool mohair blend. It’s a thicker art yarn with many different components, like sequins, silk flowers and ribbons. 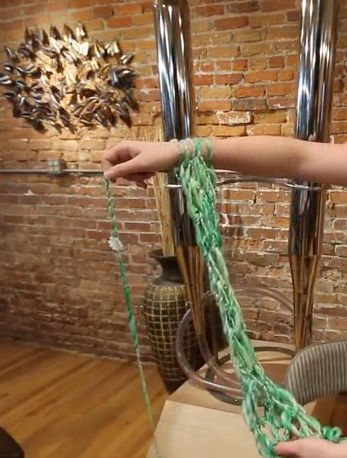 But you could do this style knitting with any of the crazy art yarns that you’ve found or spun yourself! When you’re working with most bulky yarns you can use one or two skeins at once, because I’m working with an art yarn I want to show off all of the little additions that make the yarn unique so I’m only using one. To start I’m using a long tail cast on. This gives me enough yarn to be able to weave the ends in and add some weight if I want to leave it a long scarf, or it gives me a tail to be able to make this into a multi-wrap infinity scarf. Starting by making a slip knot, this will become our fist stitch, then with the slip knot on my right arm, my left holds the tail and the working yarn with the tail closest to me held by my thumb and the working yarn with my index making a Y.
I take my right hand to scoop up the outside by my thumb so I have created a 4 then pick up the yarn across the index finger pulling it though the loop of the 4 slide this onto your arm… and you’ve made the second stitch! Snug up the yarn a little but not too tight and continue to cast on until you’ve got the number of stitches or the width you want the piece to be. Remember the slip knot is the first stitch. This is a thin scarf with only 6 stitches if you want thicker cast on 10-15. When I’ve finished casting on I hold the working yarn in my right fist and use my left to slide on stitch off the right making the loop grasped in my right into a stitch and placing it on my left wrist. Try to tighten the stitch on the left hand as best you can. For the next stitch we follow the same pattern. Grasping the working end in our right hand pull the stitch off your right arm and with the loop created slide that onto your left hand. When all of the stitches are on the left arm we do the same as we did for the right only holding the working yarn in our left hands. Finally to start the bind off continue as we did when we add stitches only 2 time, so I ended with my stitches on my right arm, I make to stitches that go on my left, then I take the stitch that is closest to my elbow and pull that over the other, that is one stitch bound off, I make another stitch onto my left and again move the stitch that is closest to my elbow over the other stitch and off. Continue until there is only one stitch on my arm, all the rest are bound off. Last stitch hold the loop pull your yarn off the arm pull your working yarn through the loop, like a slip knot cut the end then pull the loop through end and we are bound off. To finish the piece you can use a crochet hook and the tails to bind the piece into a long loop, an infinity scarf, or you can weave the ends in. Next articleCongratulations to the Corriedale!